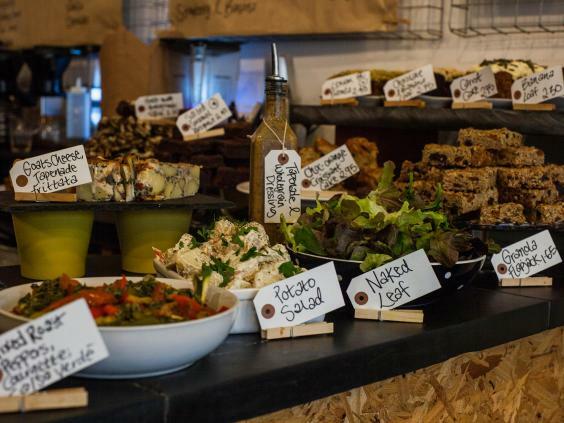 Enter Brew and a sprawling array of colourful food from seed-topped carrot cakes to chunky quiches cleverly stacked on a protruding counter is the first thing you see, just as owner Matt Atkins wanted it. 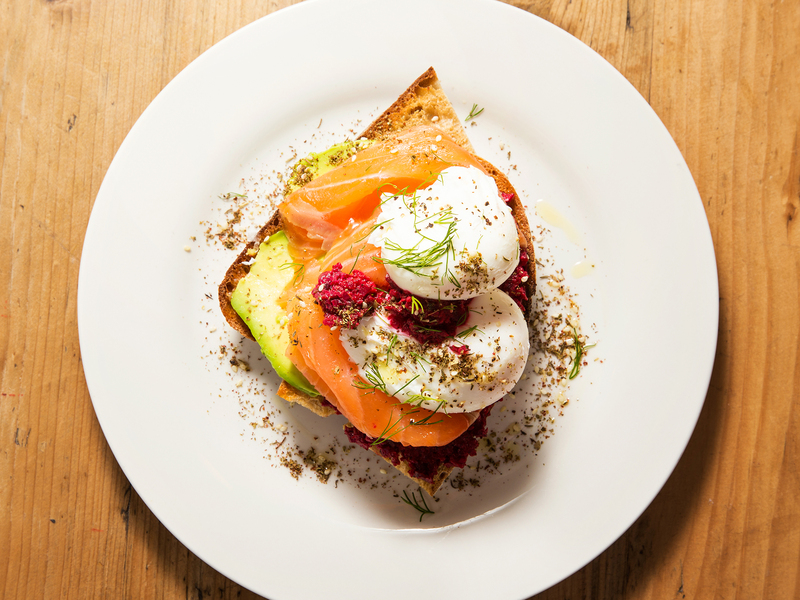 But take a look at the brunch menu, and his antipodean and Middle Eastern inspired offerings are what set this café apart from the multitude of others along one of Bristol’s premier roads, Whiteladies. Atkins wanted to step away from the full English as he saw the café trade pushing away from it at the time of opening in May 2014. “But clearly that’s not what was happening,” said Matt, as despite it never being the plan, there’s now a Big Brew (£10.95) topping the menu, following customers asking for a big hangover-friendly dish. The Big Brew translates as smoked bacon, a fennel and sage sausage patty, poached eggs, roasted field mushrooms, Brew beans and tomato relish which sprawls over a huge bowl-like plate. The last two components were created after Atkins decided he wouldn’t serve Heinz baked beans. Both were inspired by the blossoming food scene in Melbourne, where Atkins had previously lived. The tomato relish has a healthy pinch of Middle Eastern flavours and is an ode to Tomato Ketchup, but with notes of charred bacon to make it more flavoursome. “As for the Brew Beans, it was more like recreating the wheel,” Atkins said. After researching what makes a great bean, and ignoring all the advice sent their way, he found the real secret was getting the right depth in the tomato sauce which is cooked slowly over a few hours. Ten ingredients make up the recipe, including Marmite, Chipotle paste and cannellini beans – and the rest Atkins, quite rightly, kept to himself. When I visited, sitting on the decking in the sun on a Sunday morning, I opted for The Brewfest (£7.85); smoked bacon, poached eggs, avocado and tomato relish all served up on sourdough toast. Thankfully the toast was buttered – something I can’t abide by if not. The eggs, so perfectly shaped, were a dead giveaway they were straight from a real farm thanks to their deep orange yolk colour and poached to perfection, and the tangy hint in the tomato relish is just one of the perfectly executed components that sets this above the rest. For Atkins, his favourite brunch dish is the sausage patty burger. 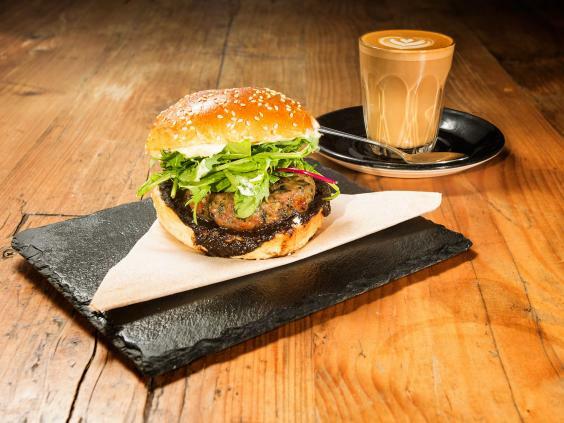 “I like the classics, and this is essentially a sausage bap, but we came up with our own sausage recipe and aioli and mushroom ketchup served in a burger bun, and it’s proven quite popular too.” He pairs it with their signature juice, the liquid hangover cure made from lychee, lime, beetroot and ginger. “We brew this up overnight, every night, so that by the next day all the flavours have come together and left a great juice behind and served over ice.” As well as creating his own essential beans and relish, he was adamant Brew would not have a silver chiller fridge with food sitting in it all day, just waiting for someone to buy it. Instead, the food is proudly displayed at the front of the café, and once it’s gone, it’s gone – until tomorrow. And in true Bristolian style, almost everything on the menu is home-made and locally sourced. Eggs come from a Wiltshire farm, the cheese is from a local cheesemonger in St. Nicks’ market and even the pittas and wraps are local. While the coffee, from nearby Clifton Roasters, changes three times a year along with the seasons. But the key to Brew’s success is its deliberate decision to make it a place where Atkins would like to hang out himself. 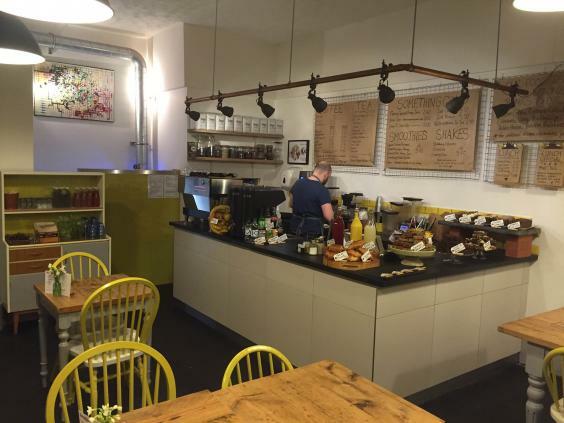 The scandi-inspired interior – designed and created by staff, and includes up-cycled local materials – with fresh yellow chairs and light grey walls, lets the food take centre stage.